To reduce poverty by enabling the poor households to access gainful self-employment and skilled wage employment opportunities resulting in appreciable improvement in their livelihoods on a sustainable basis, through building strong and sustainable grassroots institutions of the poor. As NRLM follows a demand driven strategy, the States have the flexibility to develop their livelihoods-based perspective plans and annual action plans for poverty reduction. The overall plans would be within the allocation for the state based on inter-se poverty ratios. The poor will drive the agenda, through participatory planning at grassroots level, implementation of their own plans, reviewing and generating further plans based on their experiences. The plans will be demand driven and also be dynamic. Livelihood services include financial and capital services, production and productivity enhancement services that include technology, knowledge, skills and inputs, market linkages etc. The interested rural BPL youth would be offered skill development after counselling and matching the aptitude with the job requirements, and placed in jobs that are remunerative. Self-employed and entrepreneurial oriented poor would be provided skills and financial linkages and nurtured to establish and grow with micro-enterprises for products and services in demand. These platforms also offer space for convergence and partnerships with a variety of stakeholders, by building an enabling environment for poor to access their rights and entitlements, public services and innovations. 1. Universal Social Mobilization: NRLM would ensure that at least one member from each identified rural poor household, preferably a woman, is brought under the Self Help Group (SHG) network in a time bound manner. NRLM would ensure adequate coverage of vulnerable sections of the society such that 50% of the beneficiaries are SC/STs, 15% are minorities and 3% are persons with disability, while keeping in view the ultimate target of 100% coverage of BPL families. 2. Promotion of Institutions of the poor: Strong institutions of the poor such as SHGs and their village level and higher level federations would be promoted. 3. Training, Capacity building and skill building: NRLM would ensure that the poor are provided with the requisite skills for: managing their institutions, linking up with markets, managing their existing livelihoods, enhancing their credit absorption capacity and credit worthiness, etc. 4. Revolving Fund and Capital Subsidy: Subsidy would be available in the form of revolving fund and capital subsidy. 5. Universal Financial Inclusion: NRLM would work towards achieving universal financial inclusion, beyond basic banking services to all the poor households, SHGs and their federations. 6. Provision of Interest Subsidy: The rural poor need credit at low rate of interest and in multiple doses to make their ventures economically viable. 7. NRLM would look at the entire portfolio of livelihoods of each poor household, and work towards stabilizing and enhancing the existing livelihoods and subsequently diversifying their livelihoods. 8. Infrastructure creation and Marketing support: NRLM would seek to ensure that the infrastructure needs for key livelihoods activities of the poor are fully met. 20% of the state’s programme outlay is reserved for this purpose. 9. Skills and Placement Projects: NRLM would pursue skill upgradation and placement projects through partnership mode as it is one of the best investments in youth, and provides impetus to livelihoods opportunities in emerging markets. National Skill Development Corporation (NSDC) would be one of the leading partners in this effort. 15% of the central allocation under NRLM is earmarked for this purpose. 10. Rural Self Employment Training Institutes (RSETIs) : NRLM encourages public sector banks to set up RSETIs in all districts of the country. RSETIs transform unemployed rural youth in the district into confident self-employed entrepreneurs through need-based experiential learning program followed by systematic handholding support. 11. Innovations: NRLM believes that successful innovations can reduce the learning curve for poverty eradication by showing a better pathway or a different pathway out of poverty. 5% of the Central allocation is earmarked for innovations. NRLM is a Centrally Sponsored Scheme and the financing of the program would be shared between the Centre and the States in the ratio of 75:25 (90:10 in case of North Eastern States including Sikkim; completely from the Centre in case of UTs). A phased implementation approach is adopted in NRLM. NRLM would reach all districts and blocks by the end of 12th Five-year Plan. The blocks that are taken up for intensive implementation of NRLM, would have access to a full complement of trained professional staff and cover a whole range of activities of universal and intense social and financial inclusion, livelihoods, partnerships etc. The Government of India’s $5.1 billion National Rural Livelihoods Mission (NRLM) is one of the world’s largest initiatives to improve the livelihoods of poor rural people and boost the rural economy. The NRLM aims to directly benefit around 350 million people - or almost a quarter of India’s population - in 12 states which account for almost 85 percent of India’s rural poor (Bihar, Chhattisgarh, Gujarat, Jharkhand, Karnataka, Madhya Pradesh, Maharashtra, Orissa, Rajasthan, Tamil Nadu, Uttar Pradesh, and West Bengal). Most of the rural poor in these states belong to traditionally marginalized social and occupational groups. The funda of the program is the creation of village-level institutions which will help the poor to promote savings and build productive assets of their own. It will empower farmers, milk producers, weavers and artisans to link up with markets and negotiate better terms of trade for their products and services. The program will also equip poor rural youth with the skills and opportunities to secure jobs in India’s mainstream economy. 3 June,2011: Sonia Gandhi launches National Rural Livelihoods Mission. The UPA chairperson, Sonia Gandhi today launched the National Rural Livelihoods Mission (NRLM), a re-christened version of the ongoing Swarn Jayanti Gram Swarozgar Yojana from Banswara, Rajasthan. The NRLM recognizes the potential that the poor have to come out of poverty with proper handholding, training and capacity building and credit linkage and that they have multiple livelihoods – wage employment and self employment. It will stabilize and enhance incomes from both the livelihoods and promote diversification of livelihoods. The role of Banks will be of prime importance under NRLM as a source of credit for the poor at reasonable rates. NRLM will focus on getting banks to lend to the poor by making them bankable clients through smart use of subsidy. 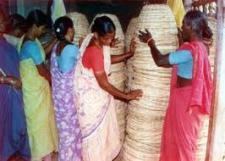 NRLM will have special focus on the poorest households, who are currently dependant on MGNREGA. These families will be supported to broaden their livelihoods through assets and skill acquisition which will enhance the quality of their livelihoods significantly. NRLM will focus on women and on vulnerable sections such as scheduled tribes, scheduled castes, minorities, women headed families, etc. The second focus of NRLM would be rural youth of the country who are unemployed. They will be supported through placement linked skill development projects through which their skills will be upgraded through short term training courses in sectors which have high demand for services. The main weaknesses of the SGSY were uneven spread in the formation of Self-Help Groups (SHGs), high attrition rate in the SHGs, lack of adequate access to banking facilities, lack of capacity building and training and inadequate risk mitigation. NRLM would provide greater focus and momentum for poverty reduction to achieve the various Millennium Development Goals by 2015.